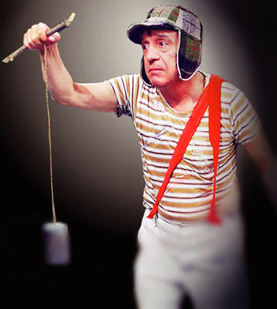 Some journalists said Bolaños was a Latin version of Charles Chaplin. Just like Chaplin, Roberto Bolaños was a master  of the art of writing and acting. 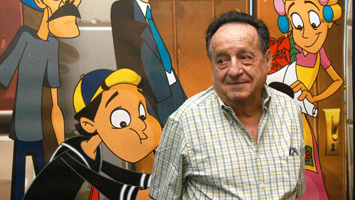 In the early 1970s he created the Chaves and Chapolin series. These series were exported to lots of countries. In Brazil, the Chaves series has been on TV since 1984, on the SBT channel, which has also re-run  episodes of Chapolin. The main Chaves characters are three children, who are played by adult actors: Chaves (Bolãnos), Quico (Carlos Villagrán) and Chiquinha (Maria Antonieta). Quico is the son  of Dona Florinda, and Chiquinha is the daughter  of Seu Madruga, played by the excellent actor, Ramon Valdés. Chaves is an orphan . The scenes are extremely simple, as are the clothes the characters wear. Through simple, malice-free stories, the Chaves show has managed to captivate millions of fans worldwide to this day. Roberto Bolaños was born in Mexico City on February 21, 1929. Like many children, he dreamed of being a soccer player. Another passion of his was music. He could play the guitar well. The comedian died on November 28, 2014, aged 85, from a cardiac arrest . Bolaños health suffered because of his smoking . Valdés, another great Chaves actor, was also a smoker , and died in 1988, of cancer. Roberto Bolaños was married to actress Florinda Meza, who was also in the Chaves series, playing the character Dona Florinda.